Alvin Leung, arguably one of Hong Kong’s most famous chefs — he’s one of three judges on the popular reality cooking show MasterChef Canada - has opened a new casual tapas restaurant in Wan Chai. He's also the brains behind three Michelin starred Bo Innovation and one starred MIC Kitchen. 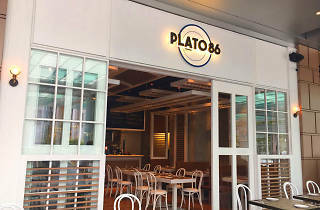 Located in the Brim 28 complex, close to Leung’s Korean concept Bib N Hops, Plato86 touts itself as traditional Spanish cuisine with modern touches and contemporary presentation. The restaurant is large and airy with white tables and chairs, complete with outdoor seating, giving the eatery an overall Mediterranean vibe. We pitch up at a booth and tick off our tapas, starting with octopus crudo ($128), served with mojo verde, Piedmont pepper sauce and puréed sweet potato. The octopus is wonderfully tender, well complemented by the sauces with some crunch and sweetness from sliced and sauteed red onion. Next is the broken egg potato tarta ($35) and it’s disappointing. Though the egg is runny and the potatoes fluffy, they're drowned in olive oil, making for a rather soggy dish. For mains, the Valencian paella ($165) with chicken, chorizo and saffron is the perfect size for two. The paella is one of the more authentic offerings we’ve had in town, with a satisfying silky oiliness from the robust chorizo but a little lacking in chicken. We finish up with some sad, floppy churros ($70). Served with a rich dark chocolate sauce, the churros themselves are undercooked on the inside and fall apart. 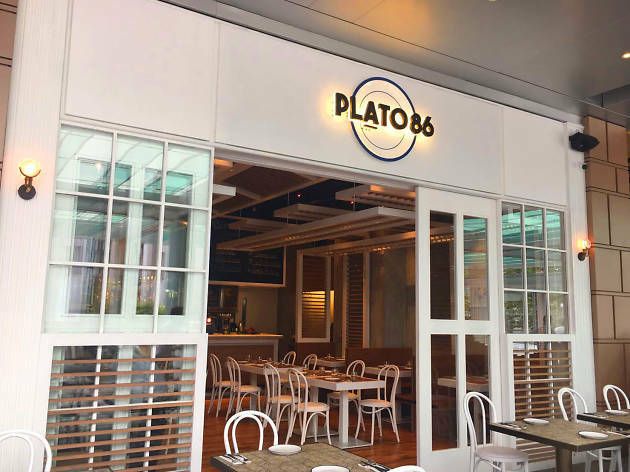 Considering Plato86 is the latest from Leung – the creator of 'X-treme Chinese' cuisine and a dish that featured an edible condom on a mushroom beach – it's pretty pedestrian. That said, it's seriously wallet-friendly and though it’s not mind-blowing, Plato86 is one of the more solid tapas restaurants in town. Though it can’t compete with its neighbours Ham & Sherry and 22 Ships, if you want some cheap and cheerful tapas, head to Leung’s latest offering.